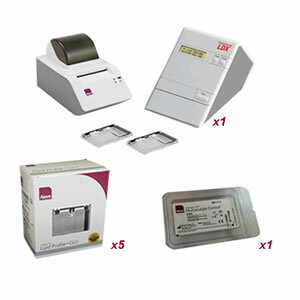 The Alere Cholestech LDX Starter Kit (14-204) includes all of the necessary supplies required to conduct a health screening using Lipid Profile+Glucose cassettes. The LDX only requires 40uL of blood and takes just 5 minutes to generate a lab-accurate, comprehensive measurement of a patient’s cholesterol levels. The speed and ease of use of the LDX System enables doctors to counsel patients at the time of the testing – a tremendous therapeutic advantage over traditional lab testing and a more convenient option for patients. The LDX is “CLIA waived” under the Clinical Laboratory Improvement Amendments of 1988 and CRMLN Certified. The system is simple to use, requires minimal training and is as reliably accurate as tests offered in a laboratory. In most cases, Medicare and third-party health insurance reimburse the costs of the LDX System tests. 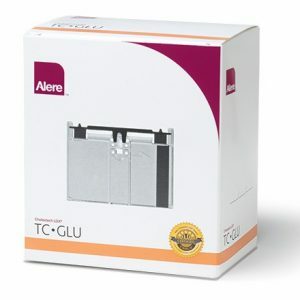 The Alere Cholestech Lipid Profile+Glucose Cassette measures total cholesterol (TC), high-density lipoprotein (HDL), triglycerides, and glucose (GLU). It also uses these values to calculate low-density lipoprotein levels (LDL). This simple test can be used to determine a patient’s risk for heart disease or to regularly monitor patients already undergoing treatment. 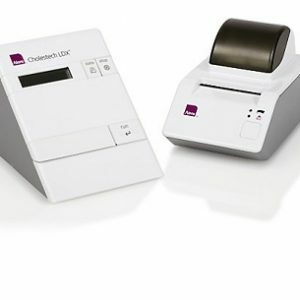 The Alere Cholestech LDX Multi-Analyte Controls are the preferred sample for quality control on the Alere Cholestech LDX System. 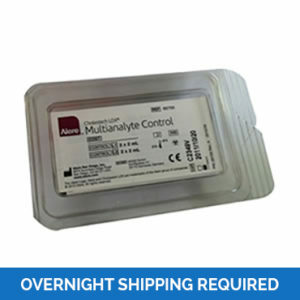 Quality control procedures include testing specimens of known concentrations (called “controls”), recording, and interpreting the values to verify system performance. Other controls may be used, but their performance must first be assessed on the Alere Cholestech LDX System, and acceptable ranges determined. Each vial contains 2 mL of sample material. Fast – Results in 5 minutes. Portable – Weighs only 2.9 pounds, making it ideal for use in the field as well as in the office environment. Versatile – Offers a variety of cholesterol testing combinations including, TC, TC-Glucose, TC-HDL, TC-HDL-Glucose, Lipid Profile, and Lipid Profile+Glucose. 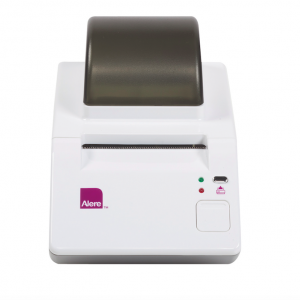 User-Friendly – Requires minimal training and includes an easy-to-use printer that can provide multiple copies of test results for convenient chart management and patient handout. CRMLN Certified – This certification validates that the system consistently meets the Gold Standard for accuracy and reproducibility developed by the Centers for Disease Control and Prevention (CDC) for the measurement of total cholesterol and HDL cholesterol consistent with National Cholesterol Education Program (NCEP) analytical goals. Approximately 85% of the cholesterol in our blood is produced by our own bodies with the remaining 15% coming from animal products found in our diet. Moderate amounts of cholesterol (a type of lipid) are essential for production, maintenance, and fluidity of cell membranes; nerve insulation and conduction; as well as hormone and bile salt production. The total cholesterol reading is an indication of the overall amount of cholesterol circulating in the blood at the time the test is given. High density lipoprotein is beneficial to heart health due to its ability to transport cholesterol and triglycerides within the water-based bloodstream to the liver for removal or re-utilization. Triglycerides are created by conversion of unused calories and carbohydrates into fat (another type of lipid). These fats are stored for use as the body’s energy source between meals. Low-density lipoproteins are large particles that have the ability to transport cholesterol through the blood and directly into the artery walls, which creates a dangerous build-up of lipids and plaque known as atherosclerosis.